I mentioned that my brother Mark, and I did the best we could to document the old Trinity Lutheran Church before it was torn down. I decided to run the photos over a period of time rather than dumping them all at once. 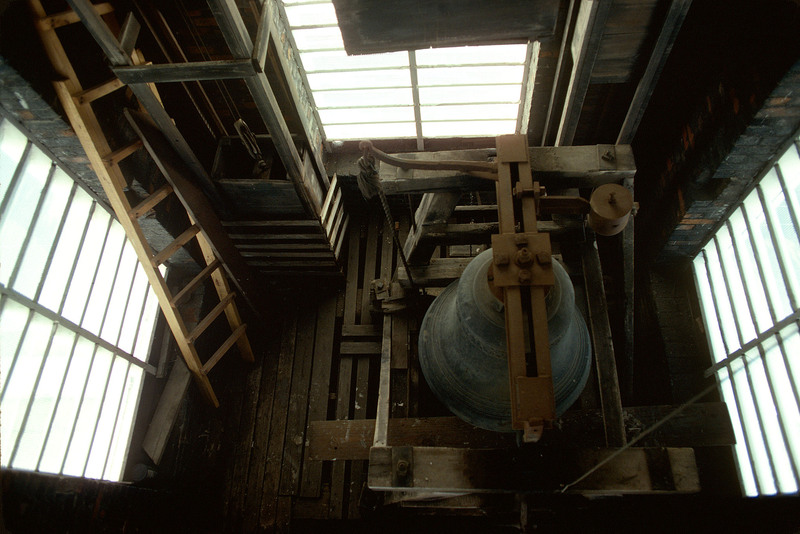 These photos were taken of the bell in the bell tower in August of 1978. (I’ll deal with the clock later.) As always, click on any image to make it larger. How’d the bell-ringer know when to ring? He’d listen to the service on the radio shown here on the left. This is one of those cases where the photo worked better in black and white. Note how wavy the glass in the mirror is. 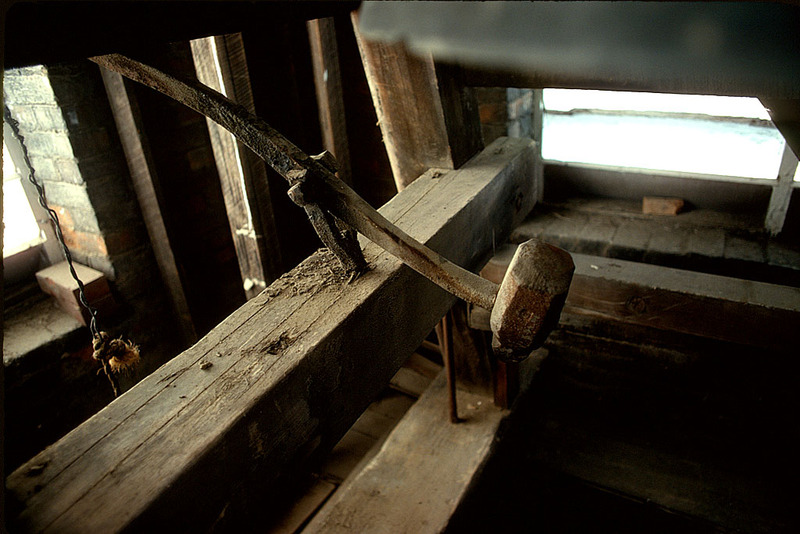 The bell had a clapper hanging inside it like you normally see, but it also had something that looked like a sledge hammer that could serve as a striker. I’m sure someone will be able to explain when it was used. You never know who to believe. 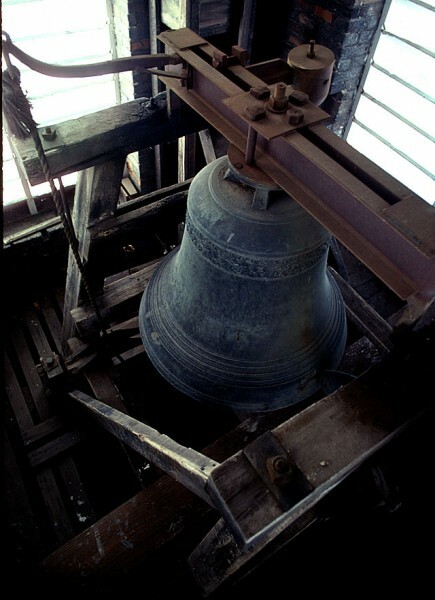 The bell has a date of 1867 on it. A Sept. 1, 1937, Missourian story quotes Theodore Bock, 84, 214 North Lorimier street, as saying that the bell was bought in 1866. “Mr. Bock was a lad of 12, and was a pupil at the church’s school when the bell arrived. The church, then known as the Evangelical Lutheran Church, was on William Street, east of Frederick street. 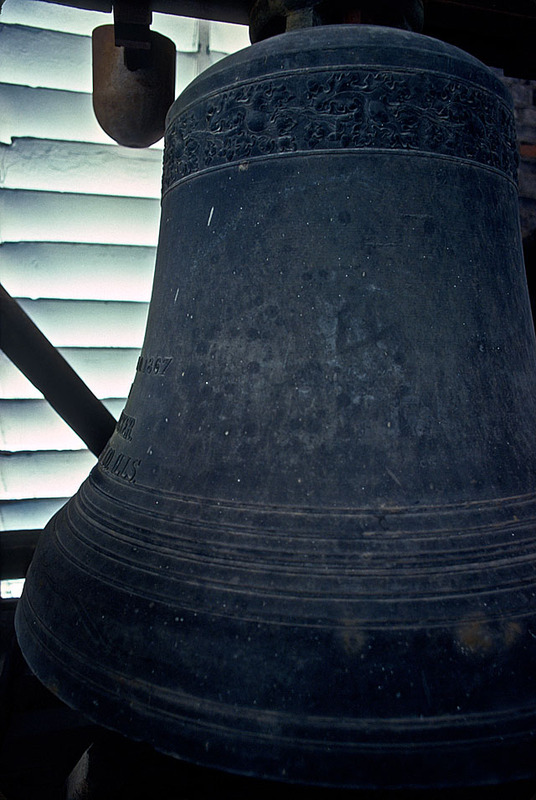 The first day the 5-foot bell was up, he recalls, it was rung all day by children and adults. Rev. Riedel was pastor at that time. A Sept. 3, 1937 Missourian story said, “…it has been revealed that the late Bernard Bremermann, father of Mrs. Alvine Owens and Mrs. Rose B. Gordon, 324 North Ellis street, Herman Bremermann, 315 Broadway, and John H. Bremermann, 19 North Fountain St., placed the heavy bell high in the steeple where it is now. I wasn’t there to capture the setting of the bell at the new Trinity Lutheran Church like I was when the First Presbyterian Church bell was hung in 1965, but another Missourian photographer was. 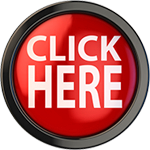 Click on any photo to make it larger, then click on the left or right side of the image to move through the gallery. I enjoyed reading your blog today, and can help with the question about the extra striker for the bell. One is by pulling the rope on the bell which swings it back and forth. 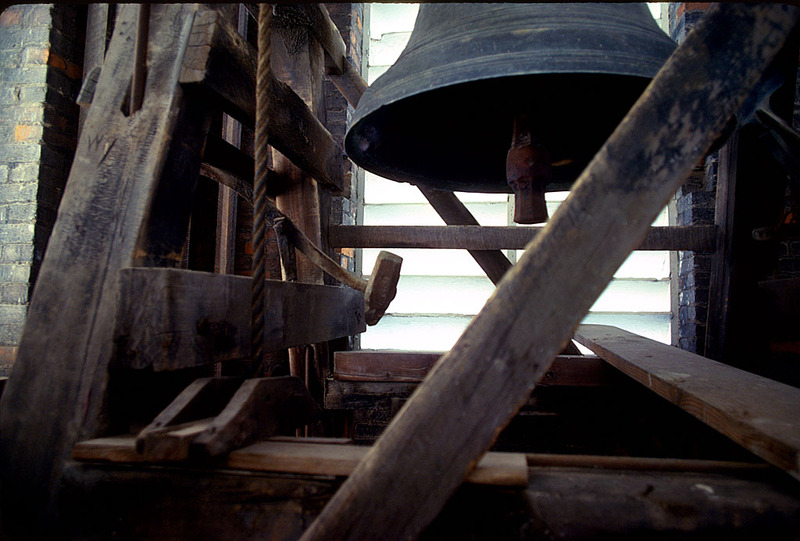 The clapper inside the bell then will strike either side of the bell in a “ding-dong” manner. This is usually done for announcing festive/joyful occasions such as the beginning of worship or so-called wedding bells. 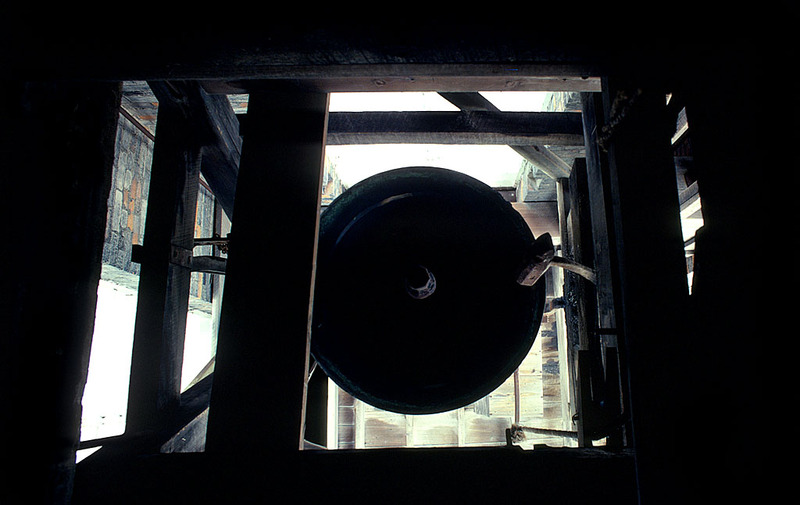 The second way to ring a bell is called tolling by which the striker is moved and strikes the relatively stationary bell. You identify the striker as looking like a sledge hammer, and essentially that’s what it is. OK, that’s probably more information that you wanted, but now you know. By the way, did/do you know Joe or Jerry Snell? Jerry was a very good friend of mine in high school (class of ’69) and a photographer who interested me in photography at Central. He also was a member of Trinity and ultimately talked me into becoming a Lutheran pastor. Jerry was a Lutheran pastor, but died in 1996. Joe is his older brother, and perhaps also a photographer, maybe a year or two ahead of us. I was in Scouts with Joe and he was a photographer on the Central photo staffs with me. When I was a kid, it was my job (or sometimes my little brother’s, depending on who was available) to ring the church bell on Saturday evening. It was supposed to be done at a fixed time, but I don’t remember what the fixed time was. It was to remind people that there were church services the next morning. At first we were small enough that we had barely enough weight to our bodies to get the bell swinging. Once going, it would be possible to just let the rope pull us up off the ground in the one direction, and get a bit of a ride out of it. I don’t think the bell was quite as big yours, though. (Photo of the church here.) My body has considerably more heft to it now. The inside of your church looks remarkably like Trinity. I’ll get around to publishing those photos in a few days / weeks. I don’t want the readers to overdose on Lutherans. Dang, I learn soemthing every day…so now when someone says “for whom the bells tolls”…I know how it it done…still not who, but at least how! My uncle, Oscar Grebing, rang that bell many, many times over the years. I also remember that on New Year’s Eve the teens in Wlather League had a chance to ring the bell at midnight. They were sternly warned not to turn it over which was acoomplished by pulling too vigorously!! 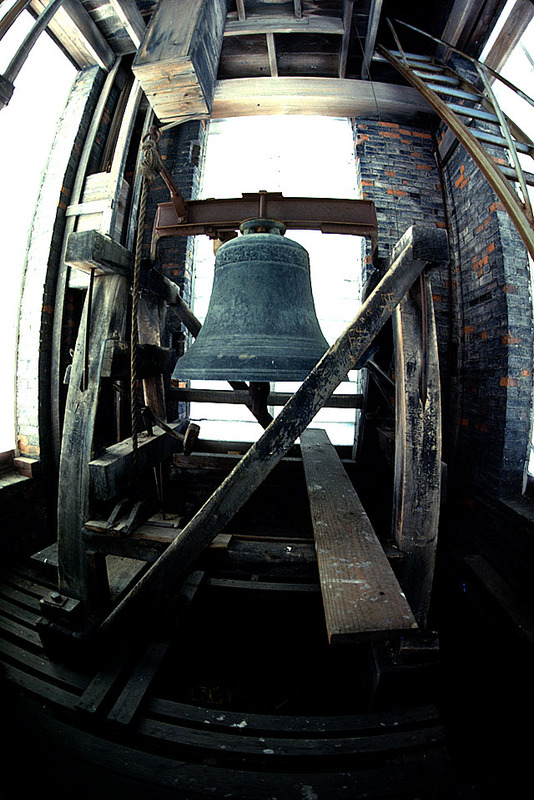 For many years that bell rang at 4 p.m. and then tolled for any deaths in the congregation. We could easily hear it at our house on NW End Blvd. My mom knew the “code” of what those tolls meant. I used to know them, but have long since forgotten. As Mrs. Hansen, my cousin, reported, my dad was the custodian at Trinity many years. Quite often dad’s would asked if their child could watch him ring the bell. In later years I would help him with the custodual work and ring the bell as his health failed. There was a trick to stopping the bell to keep from getiing an extra “ding”. You had to grab hold of the rope at a certain time and it would drag you along that slatted flooring and a padded spot on the wall would stop you. He retired before the new church was finished and they fixed it so it would ring by turning on a switch. I am one of Oscar Grebings grandchildren. Thanks for posting these pictures! It really brings back wonderful memories of Grandpa and how we all thought it was so great that he got to ring the bell. 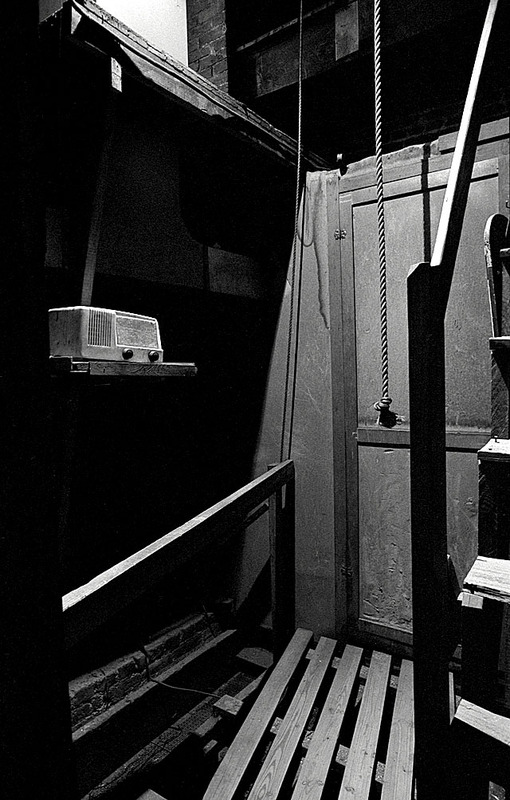 Thanks for the photos – I was up there in the bell tower at least once, maybe with Walther League, have no idea why. 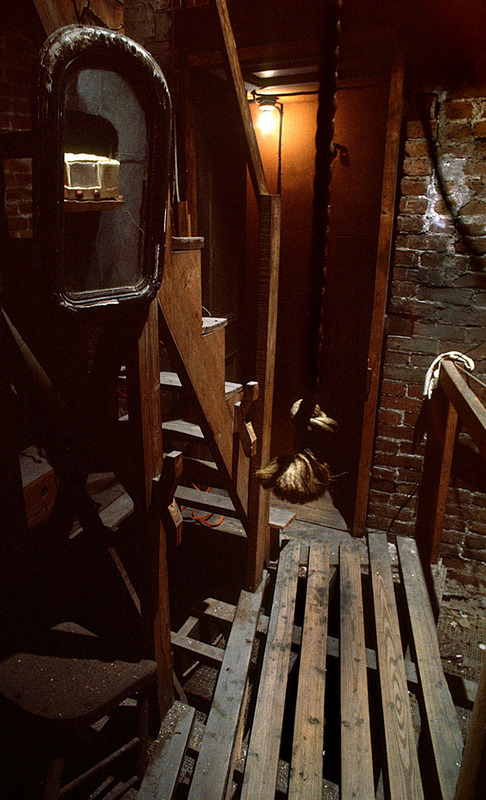 The stairs were behind the choir loft, if I remember right. Thanks for the memories. H.W.Rincker was trained in Germany in the family bellfoundry. He came to this country and set up a foundry in Chicago. 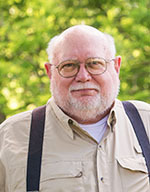 After a family tragedy, he gave up his business (though apparently he kept his equipment) and went to seminary, becoming a Lutheran pastor in Terre Haute. He retired from that because of ill health, becoming a farmer north of Effingham. 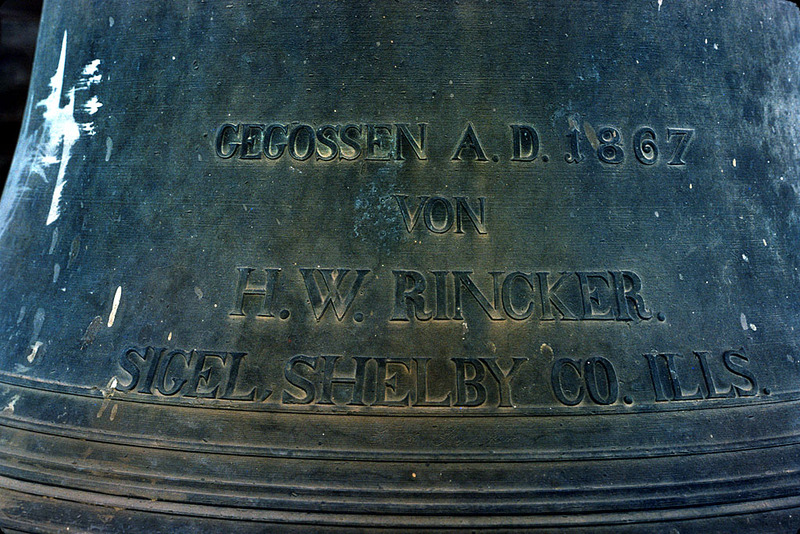 But he was called out of retirement in the 1860s to make bells for several Lutheran churches in and around Saint Louis. I’m delighted to discover another one of his bells; thanks for posting the photos! Here’s a piece I did on other church bells in the area. 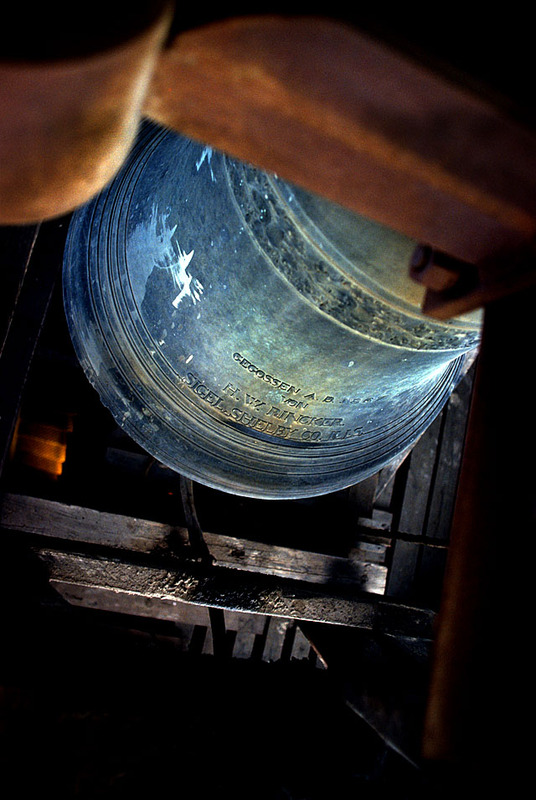 Follow the links in the story to see more about the bells. I have a few more in the pipeline. Heinrich Wilhelm Rincker was my great great great grandfather. Thanks for posting an example of his handywork. He also cast the City Hall alarm bell in Chicago that alerted all to the great fire of 1871. I grew up with church bells of different denominations. Back then it seemed to me that all of them were calling people to confession, worship and the tolling of bells for funerals was common too. I miss it today. Our Lutheran congregation is trying to bring backmour bell and sound it before the Divine Service, but some people are more concernede with the “noise problem” it would create. Ant opinions? Tom, I think it depends on the tolerance level of the neighborhood around your church. My Lutheran congregation has a carillon bell tower with about 24 actual bronze bells (including 4 large ones) which were cast in France. One of our members donated it 10 years ago. The tower chimes from sun up until about 9 pm daily on the quarter hour as well as playing hymn tunes on the hour. It also peals before and after services and on special occasions like weddings and funerals. The church is located in a newer neighborhood about 12 years old and we haven’t gotten many complaints. I think your neighborhood would probably tolerate it if you’re only playing it before services. My church plays ours much more often and it hasn’t been a problem. I live a half mile away and when the wind is in the right direction, I enjoy hearing the bells when I’m outside.